It took a long time, but Joe Calzaghe's stellar career eventually won him recognition on the world stage. 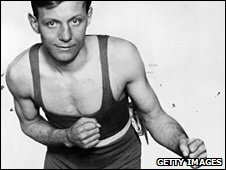 He continued a great tradition of Welsh pugilists, following the likes of Howard Winstone, Jimmy Wilde and Jim Driscoll. So where does Calzaghe stand in this pantheon of fighters? What do you think of my rankings? Having trained marathon runners and the great Ted 'Kid' Lewis in the UK, Dollings moved to New York where - in the period around 1914 - he worked with a young Ray Arcel, teaching him how to analyse fighters. Dollings was a legend at Grupp's Gym on West 116th Street, the top New York fighting gym before Stillman's emerged. Who's the greatest British boxer?